For some reason when I sat down at my computer today, I was reminiscing about when I was in the 7th and my first experience with a computer. We walked into the little computer room, and there was about 10 TRS-80’s, lined up 5 in a row. What I remember most was our this class was a basic computer intro class. We learned how to turn the TRS-80, which required a huge floppy disk, and then we learned some basic command prompts and other cool things. And my how computing has changed since the 80’s. There was no Internet on these computers, there was no jump drives, and the hard drive on the TRS-80 only had 5MB of hard drive space – compared to the 1 terabyte (TB) external hard drives that you can today for a mere $100. It is amazing where computers and programing have come from, and the future is so bright and wonderful. 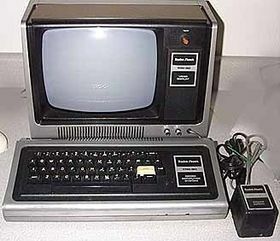 My first computer was an Commodore 64. And my first PC was an Ace. It was what I used to first hook up to the web. The manufacturing company I worked for was at the forefront of using computers to control the whole operation. From running the factory to collecting and processing data. As I was one of the more articulate engineers, I was used as both a go between for management and the IT guys and as a guinea pig for new programs. We also had a fantastic team in IT, they were not hung up with having to talk the language to get anything out of the IT department. In those days, they were just the computer guys, not the IT department. I ticked off many a outfit trying to sell programs to us. I pushed very early on for programs that did not require any kind of code type data entry, but the ability of the program to read data straight from a spreadsheet. We in engineering had too much to do to write code to make a program work. That led to a system that would take data straight from the source and allowed engineering and management to use that data to control the operation. We were touted by many organizations and won a “Top 10 Plant” award one year (mid 1990s). Unfortunately, the people who were makers and shakers in those days have either moved on or, like me, retired. That’s a great story Don! So how exactly did you get programs to read data from a spreadsheet and produce a result? Sounds almost like the spreadsheet is acting like how html files are used today. What we were doing was taking data generated from the program and trying to use it to do graphs, statistical analysis, business analysis. The programs being presented needed someone to sit at a monitor and to enter the data in a DOS type program. My analogy was we wanted the program to be a car. You sit at it, start it, put it in Drive, and go. You have no idea how it works. What we ended up with is a program that you could transfer data from lotus 123 (the spreadsheet we all used) to the programs spreadsheet and manipulate the data. This was possible with the manufacturing and test data being generated also. We had lots of visitors looking at our system. When we had quality system audits from the big 3 or European companies, we were told nobody had the data collection that we had. This would have been in the late 80s to early 90s. Just to give you an idea of our customers, they were: GM and GM Europe including Saab, Ford and Ford Europe including Jaguar and Volvo, Renault, Lamborgini, Fiat, BMW, Mercedes, Chrysler and Jeep, Daewoo, Kia, Seat, VW and Audi, and others I have forgotten. We had become, in 5 years, the #3 manufacturer of fuel injectors, #2 independent. Rochester Products was #2 but they had a captive customer. We also supplied Rochester along with Bosch who is #1. It was very exciting and enjoyable to go to work. We eventually had big management changes and everything went in the tank. So I and others who could retired. Others left the organization. It is what happens. Management is the key.